Johnnie Sutherland, and Lari Cowgill. 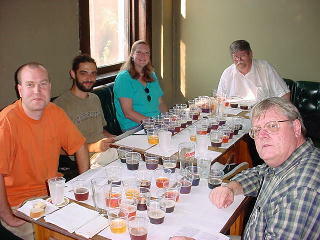 Owen Ogletree (director of Brewtopia Events) gathered together some of his devoted beer loving friends in June of 2002 at Athens' Globe pub to sample and comment on several mixed styles of high alcohol ales, lagers, and ciders. This beer sampling was done as a blind tasting where no one was aware of the brands that were being served. Beers were informally commented upon and ranked according to American Homebrewers Association (AHA) style guidelines. First, second, third places, and honorable mention were awarded to the beers we felt represented their individual styles in extraordinary fashion. At this time, none of these world class beers are available for sale in Georgia due to outdated alcohol laws. Visit Georgians for World Class Beer to find out how you can help change these prohibitive laws. Drop Owen an email to share your comments and opinions. Aroma: Raisins, chocolate, American hops. Appearance: Dark brown with ruby highlights, good head retention. Flavor: Hoppy, American hops, resin, citrus, chocolate notes. Malt is balanced by hops. Spicy, toffee-like, roast hints, chicory, rummy. This beer is a great blend of malt, chocolate character and hops -- it is delicious! Aroma: Banana, clove, spice, bubblegum, herbs, earthy character, caramel -- very complex! Appearance: Cloudy brown - nice. White, creamy head. Flavor: Banana, clove, complex character. Wheat, alcohol, creamy, soft, fruity, smooth, raisin. This is a pleasant and complex beer -- well made example of the style! Aroma: Mild malt aromas with a hint of lightstruck (skunky) notes? Appearance: Well carbonated, very clear, brilliant golden yellow. Flavor: This is like an American Standard Lager with an alcohol kick. It is a bit sweet with much more body than an American Standard. Warming, but the alcohol is balanced by malt. This is well played for an 8% lager and conforms perfectly to what is expected from an American Malt Liquor style. Aroma: Toffee, dates, fruit, earth, plums, cellar, pineapple. This beer has a well balanced aroma -- very complex too. Appearance: Very clear, deep reddish/brown with good carbonation for this much alcohol. Flavor: Hints of sherry, alcohol, toffee, caramel, and fruit. This is well balanced and tastes like an English Barleywine (lacks American hop character). Hops are subdued and malt is not cloying. Pleasant, complex, and warming. This bottle tastes well aged and is wonderful. Aroma: Lots of American hops -- perfumy, resiny, and citrusy -- but balanced by a great deal of nice malt. Flavor: Low carbonation with a firm bitterness. This ale is well balanced -- dry, yet has a good malt presence. Fruity, woody, resiny with raisin, plum, and spice notes. This is a bold, impressive, big, hoppy beer. Good job. Appearance: Golden -- at the light end of style. Very clear. Flavor: Rich mouthfeel with toast, caramel, alcohol and low hops (good for style). This is a mild, mellow lager with hints of fruit. Alcohol burn is a bit big. The malt coats the tongue. Specialty Beer with juniper, maple, vanilla, oak, and peated barley. Aroma: Smoke, juniper, syrup notes. Appearance: Amber, deep copper, clear, nice/creamy head. Flavor: This is smooth for an 11% alcohol beer. There are hints of licorice on top of all the layers of complex flavors. Dry, oaky, smoky. Flavors come in waves all over the mouth as you sip and after you swallow. Wow -- an interesting beer. Aroma: Pleasant, fruity, cola-like, sweet, caramel, nutty, mild (yet complex). Appearance: Ruby, nice head, beautiful. Flavor: Winey and somewhat thin compared to the complex aroma. Cola flavors are sweet and body is a bit light for style. There is a hint of spice and fruit, but flavor needs more complexity. Aroma: Honey notes -- very aromatic. Chive-like with earthy notes and hints of solvent. Appearance: Clear, light copper/gold. This is a still cider with no carbonation. Flavor: Sweet but with hints of apple tartness. Pie-like, candy-like with notes of brown sugar, raisins, and solvents (higher alcohols). This would be a very warming cider to sip by a fire. Aroma: Burnt apple with hints of caramel and roasted grains. Appearance: Jet black with a thick/viscous pour. Flavor: Falls a bit flat. Soy, roast, chocolate, malt. Flavors need to be more full and bold for style. This is a bit light in body for an Imperial Stout. Sweet and drinkable, but somewhat weak for style.